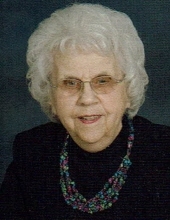 Bernice Virginia Hilzendager, 104 ½, died on Monday, March 18, 2019 in Rugby, North Dakota. She was born Bernice Ritterman to Frank and Anna Henrietta (Fossum) Ritterman in York, North Dakota on August 26, 1914. Her family lived on a farm near York where she grew up with her 9 brothers and sisters. The family moved into Rugby when Bernice was in the first grade and later graduated from Rugby High School. Each summer they moved to the farm and when school started in the fall the family moved back to Rugby. They were called “sidewalk farmers” ! She married Johnnie Hilzendager on August 20, 1934 in Rugby. They made their home in Rugby living with her parents for 5 years before they built their own home. They were the parents of three children. Bernice loved to play cards, listen to the Lawrence Welk show on television, bowling, dancing and the many trips that she and Johnnie enjoyed. She bowled until she was 85 years old. In her early years she was active in the church, hospital auxiliary, and Cub and Girl Scouts as a leader. Bernice was known as the neighborhood “welcomer” since she always had goodies to share with friends and family. Bernice lived in her own home until she was 100 years old and then moved into the house that her father had built and lived there for 3 ½ years before becoming a resident of the long term care unit of the Heart of America Medical Center. Bernice was a wonderful person and will be missed by her family and friends. She is survived by her son-in-law John Feuling and daughter-in-law Sue Hilzendager. She leaves 10 grandchildren: John, Mark, Tom and Tim Feuling, Mary Beth Krysl, Jan Voeller, Trica Mueller, Eric Harmel, Brooke Epperly, and Adam Hilzendager She also leaves 17 Great Grandchildren and 2 Great-Great Grandchildren. Three special friends, Roger Sitter, Janet Miller, and Karen Anderson will miss her company very much. She was preceded in death by her husband, Johnnie on June 11, 2006, her daughters, Beverly Feuling, Vicky Harmel, and her son, John “Butch” Hilzendager, in addition to her 4 sisters and 5 brothers. Funeral services will be held at Little Flower Catholic Church in Rugby with Rev. Thomas Graner officiating, on Thursday, March 21, 2019 at 11:00 A.M. with a later burial in the church cemetery. To plant a tree in memory of Bernice Virginia Hilzendager, please visit our Tribute Store. Visitation will also be held on Thursday morning from 8: 00 AM until 10:30 A.M. There will be no reviewal at the church. "Email Address" would like to share the life celebration of Bernice Virginia Hilzendager. Click on the "link" to go to share a favorite memory or leave a condolence message for the family.